I have been working on a new design scheme for my new home office, to better suit my style and personality, so that it becomes more inviting and fun to be in. My inspiration is taken from Domino’s Book of Decorating (shown above). It is very feminine and glamorous, and I love the black and white balanced with the soft blue. Another item I want to bring is is a large mirror, so I can hang it over my desk when it’s facing the wall, to give the room depth and to give me a bit more peace of mind by still being able to see the door behind me. 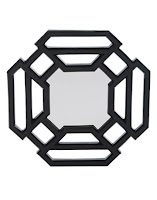 I like these structured mirrors I found, from Martha Stewart and Mitchell Gold & Bob Williams. Once I’ve made these changes, I will bring in some chic white and acrylic accessories to lighten the room up some more. I’m still looking for a great light fixture as well — preferably a nice pendant or chandelier lamp. Here is a picture of my office, as it looks now. Hopefully, it won’t be long before you can come back and see how I’ve transformed DRAB into GLAM!